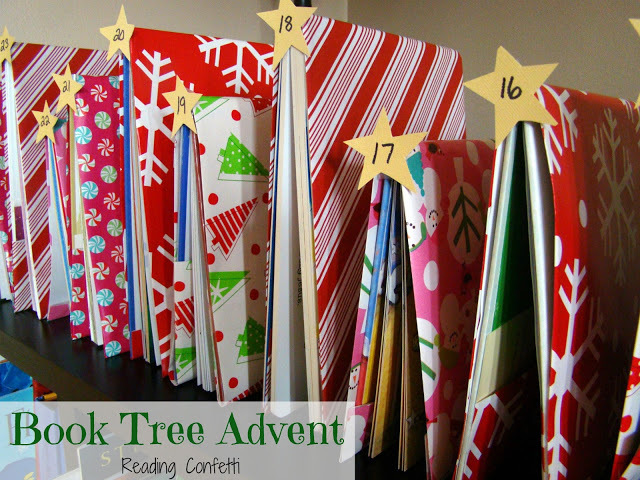 I love doing book advent calendars. 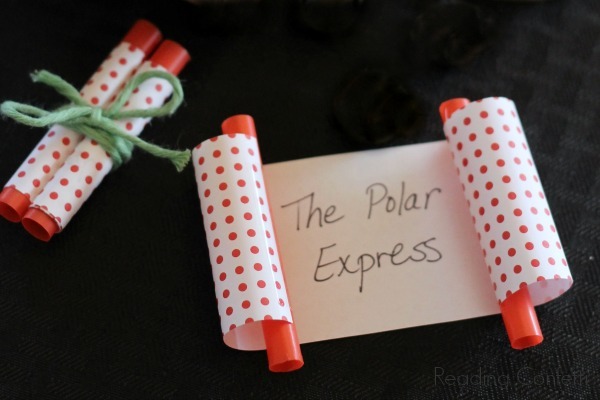 It's a fun way to incorporate some literacy into the Christmas preparations and a great way to be sure we make the time to read our Christmas favorites. This year I was determined to incorporate literacy into our advent calendar while leaving the Christmas books available for the entire month. Instead of wrapping each book, I made a simple scroll with the name of each book. 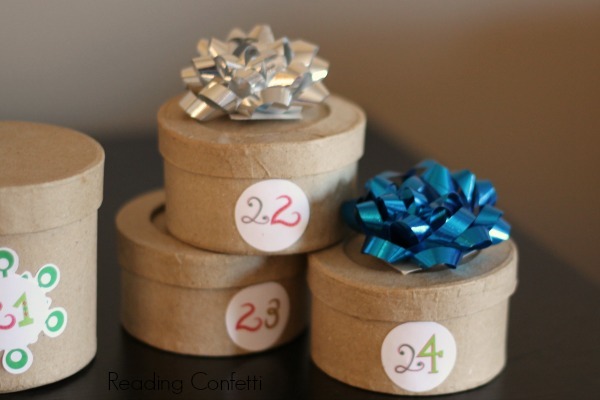 (The bonus is that you can do repeats if you don't have 24 different Christmas books.) 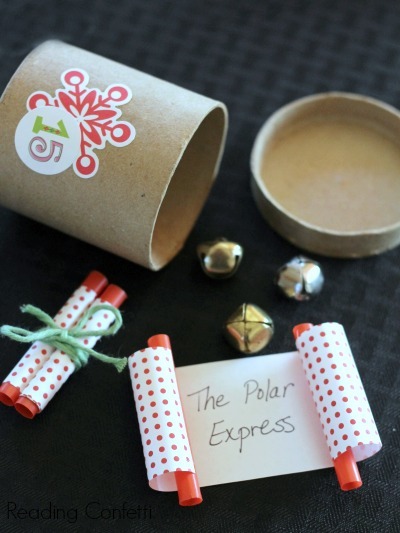 A slip of paper would work just as well, but these little scrolls make it seem more special and they're easy to make. Cut two lengths of drinking straws and a strip of scrapbook paper. Tape a straw to each end of the paper and roll toward the center, securing it with some string. Now they're ready to tuck into whatever type of advent calendar you choose. 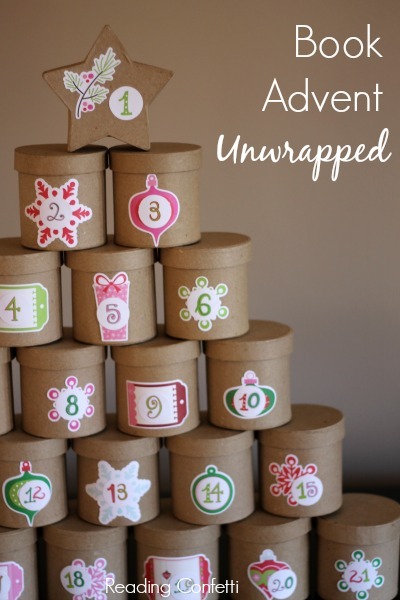 I was inspired by this advent calendar at Crafts Unleashed. I really like those little paper mache boxes. 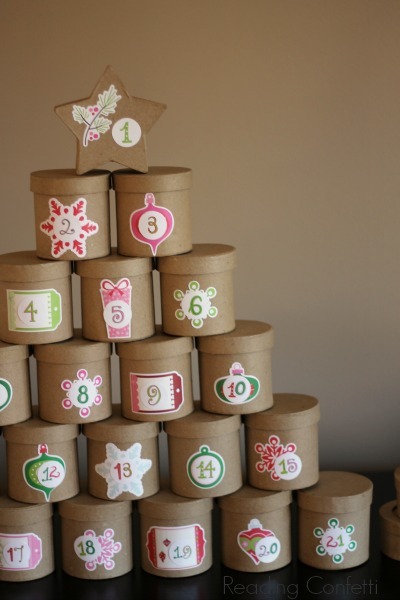 I used 23 round and one star shaped for my version of the advent calendar. I attached number cutouts I found at the craft store. Then I stacked them into a Christmas tree shape. Because the number didn't come out quite right, I have 3 presents under the Christmas tree. 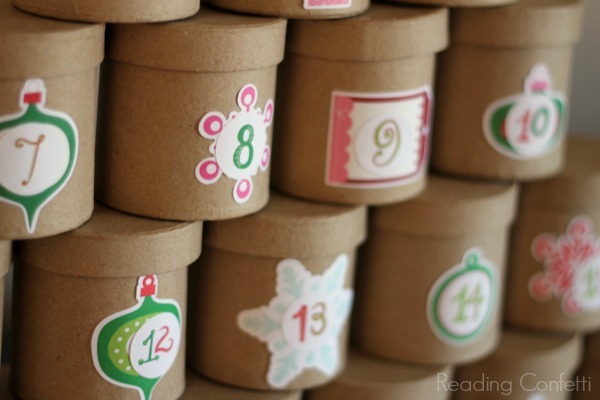 Each container has a scroll with our Christmas book for the day written on it. I also included little trinkets like Christmas erasers and stickers that I tried to match to the book. 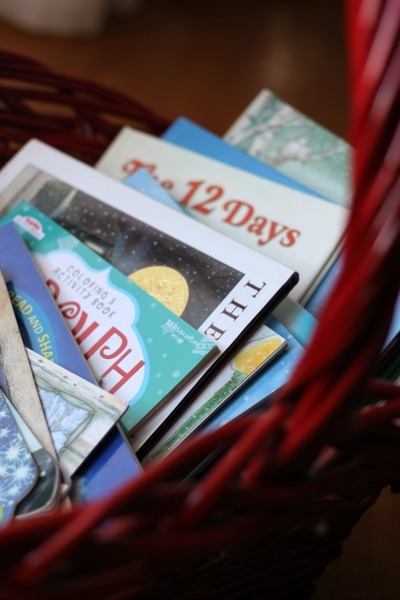 And all the Christmas books are piled in our basket, ready to be read any time. Very cute! I like having our books available to read all month long too. It is fun to highlight a book each day though. How adorable! Can't wait to do this! I love the paper mach boxes; the tree turned out so well. Wow, love that idea. That would be absolutely beautiful to display too! This is such a great idea! I will have to make one of these for my kids, my daughter loves books this would be perfect! Thank you for sharing! Now following you!